I never had a moment during those deep backbends that made me think something’s not right. The day I learned Kapo, I walked around for the rest of the day with an achy low back, but it didn’t seem abnormal. Over the next few days, however, I was in trouble. I could barely get through standing series. Every time my pelvis shifted position, I felt stabbing pain. Getting into a forward fold took at least five breaths. I took my teacher’s advice and took it easy. I iced and even took anti-inflammatories. I went to the chiropractor (five times). I saw a massage therapist. I did supplementary stretching, hot-and-cold therapy, and castor oil packs. I carefully worked into those deep backbends, only doing them if I could accomplish them without pain. Over a period of eight weeks, I seemed to be getting better. I had good days and bad days, but the general trajectory was trending towards improvement. Then something went wrong. While I was on vacation, my back suddenly got worse. Much worse. I felt great during practice and immediately after, but my back would spasm randomly throughout the day, hard enough to make me drop what I was doing and clutch onto the nearest solid object for support. I could do Kapotasana, but reaching over to pat the dog left me wide-eyed and gasping. I don’t know if it was all the walking in the snow, a few slips on the ice, or the stress of cross-country travel that brought me to my knees, literally and figuratively. Ultimately, it doesn’t matter. Something is not functioning correctly in my body and I need help. Part of my practice last week included making an appointment with a sports medicine doctor. I had to surrender. I see that doctor tomorrow, and I’m filled with fear. 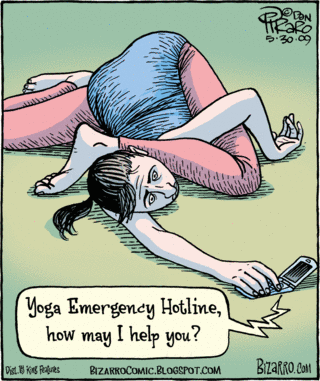 Physicians don’t understand Ashtanga. They don’t understand that what I do can’t be replaced with gentle stretching and core strengthening exercises, that I can’t take a few weeks off. They don’t understand that backbends are part of the system. I can’t proceed in the series unless I can figure out how to do them safely. I can’t just skip them and do something else instead. But these are merely fears. I don’t know what will happen in my appointment tomorrow. The doctor I’m seeing is used to treating endurance athletes. He’s a runner himself. He gets the need for daily movement. At least I hope so. Do I blame the Ashtanga system for my injury? Nope. Do I blame Taylor for giving me Kapotasana that day? Hell no. Do I blame myself for being careless or pushing too hard? Absolutely not. Injuries happen. There’s no blame involved. Blame means assigning responsibility for a wrong or fault. No wrongdoing happened here. No one hit me in the low back with a sledgehammer. Injury can happen when you’re physically active, and even though Ashtanga is a spiritual system, it involves a lot of physical activity. I accept that. I’m scared of the long-term consequences of my current condition, and have irrational thoughts that I’ll never be able to drop back again, or that I’ll be stuck on Kapotasana forever, but I recognize those thoughts as irrational. It took me two-and-a-half years to be able to bind Supta Kurmasana. That’s okay. Being unable to do a pose due to injury doesn’t make me a lesser practitioner. You know what does? Thinking that a pose defines my practice. The shapes I can make with my body mean little. It’s not the asanas that matter. It’s how I approach them, and most importantly, what I do with my day after I’m done with them. This entry was posted in Ashtanga Vinyasa Yoga and tagged ashtanga and injury, back pain, backbends, injury by Emma. Bookmark the permalink. Hey girl! Thanks for sharing! I’ve been navigating injury + practice since mid-November. It’s interesting how our journeys seem to parallel one another! I’m grateful for it, always good to have fellow passengers. Sorry to hear you’re hurting though. When I went to my chiropractor for my shoulder/scapula injury, I mentioned that I’d recently incorporated headstand into my practice. He said that may be a contributing factor. “Notice, I didn’t say you shouldn’t be doing it,” he added. I really appreciated that. It is true our practice may exacerbate issues that are already there. It doesn’t mean we should shut down our practice, but moreso that we should address the root of the problem. I would highly recommend returning to the chiropractor to see what chronic issues are hanging out and if they can come up with a plan for correction. May take way more than 5 times, which has been my experience. But it’s getting better every day, even if progress is slow. Thanks for reading and commenting, Christie! I appreciate it. I hope your shoulder heals well. My friend David Cain says that it is our intention and it’s application, not our success in achieving perfection in the execution of our practice that is responsible for the benefits pf our spiritual practice. Whatever information you receive during your medical visit, is for you to evaluate with your instinct. One thing ashtanga provides is self knowledge. Heal soon. Maria, I couldn’t agree more. Thanks for the healing wishes. People don’t know how totally disabling a lower back injury is until they have one. I had a shift in my spine once due to inflamation in the disk. Not fun and makes one wary. Hope you get a good diagnosis from the doc and post so we can be updated. If you need the name of a good PT let me know. Thanks, John. I’ve got a great PT who helped me with some old running injuries. Physical therapists are lifesavers. Thank you for sharing your experience. I can really connect with this. In July at a workshop, I had caught my ankles for the first time with assistance. The rest of the day I felt amazing. The next day however, was a different story. And I’ve been struggling with the consequences ever since. It has gotten better with multiple chiropractor appointments and a modified practice, but at least once a day I let the irrational thought of never doing drop backs or moving forward in my practice cloud my thoughts. It’s a dangerous mindset to be in. Your part about, “Being unable to do a pose due to injury doesn’t make me a lesser practitioner. You know what does? Thinking that a pose defines my practice” really sat with me. I needed to hear that gentle reminder that my inability to do deep backbends in this present moment doesn’t define me as a person or define my practice. What matters is how I show up on my mat and off. Thanks so much for sharing your experience. Many well wishes to you, your health, and your journey. Thanks for reading, Sarah. I wish you recovery and healing, too! “It’s not the asanas that matter. It’s how I approach them, and most importantly, what I do with my day after I’m done with them.” <—– RIGHT ON. I needed that reminder today. Wishing you a healthy recovery! Great read very inspiring thank you. I have a regular practice but just fractured my arm on Christmas morning. Today was the first time I practiced, obviously nothing with presure on my hands or wrist. uhg….I look forward to reading more. Sorry to hear about the fracture! I hope it heals smoothly.